Here is a summer science project. Do this one at your own risk. 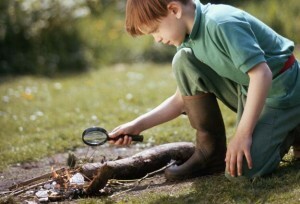 Choose an afternoon when the summer sun is burning down, get a magnifying glass and a pile of some dry combustible material. Dried leaves will work just fine. Gun powder will be more exciting. Put the burning material down on the sidewalk and then use the magnifying glass to focus a beam of sunlight onto the material. You will be amazed at how quickly smoke begins to curl away. My boys and I do this and we think it great. Jamie rolls her eyes. You know: the magnifying glass does not provide any power of its own. It serves only to direct the power of the sun. But, when it does, it brings light to a burning focus and things ignite. That is what the local church is supposed to do. By itself, the church, God’s people, do not offer any power. But, a church is like a magnifying glass that God uses to focus and direct His power. Paul says in Ephesians 3:10 that God is pleased to make declaration of Himself both to people and the Heavenly realms by means of the church. Maybe in your life, the presence of Christ does not seem powerful. You keep waiting for change and power to ignite in your life but it’s just not happening. If that is the case, then try another experiment this summer. Look for a church that centers on the Lord Jesus and His Word. Put yourself right underneath the magnifying glass on a warm Sunday and wait for Spirit and Truth to ignite in your heart.